I have been offered the Micro White scooter for adults to review. I was really looking forward to receive it, as I have been wanting one for long time. Once the postman delivered it, I was over the moon. The next weekend we all went to the park. I was really happy that now, I can cut out time just for my five year old daughter. Since the arrival of our baby, I always felt quilty that I can not cut out much time to spend just the two of us. This made her really happy too. Now we were both scooting on our Micro scooters chatting and giggling. 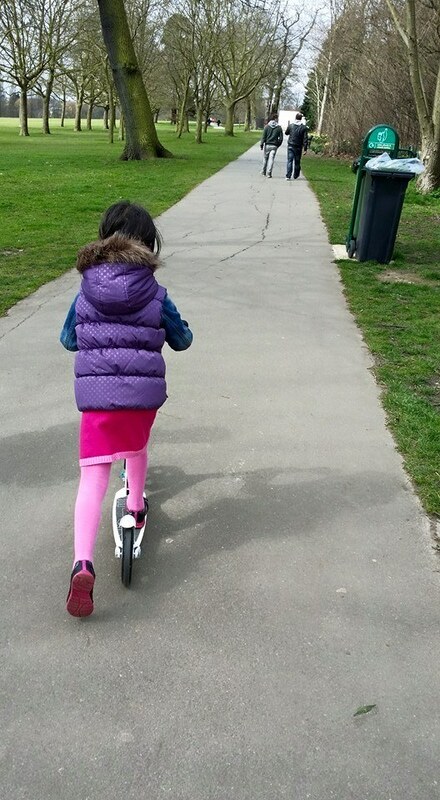 My daughter seemed really proud her mum was on a scooter with her. And this time round it was her saying to me: “Mummy, please stop, you are going too fast!” Usually it is the other way round and we had a good laugh about this role exchange. The big wheels of Micro White means you can speed up quite quickly and deals with bumps and nooks a lot better than other adult scooters with small wheels. This was a good bonus for me and we needed to take a brake to catch our breath. Boy, am I out of shape after having my baby 10 months ago! My daughter was quite exhausted trying to catch up with me. She was quite surprised to see her mum loves speed. Yes, what not to enjoy. A beautiful Spring weather, there is a little chilly wind, but from all the exercise I was getting I was not feeling it. The wind was caressing my face and keeping my hair of my face, such a lovely sensation I used to enjoy when I was a child. This enrobed me in warm childhood memories and I was glad I could share it with my elder daughter during our special “Just the two of us” time. We made couple of tours of the park which was in total 5 miles! I could feel my muscles, yeay that pleasant sensation you get after a long workout in the gym. 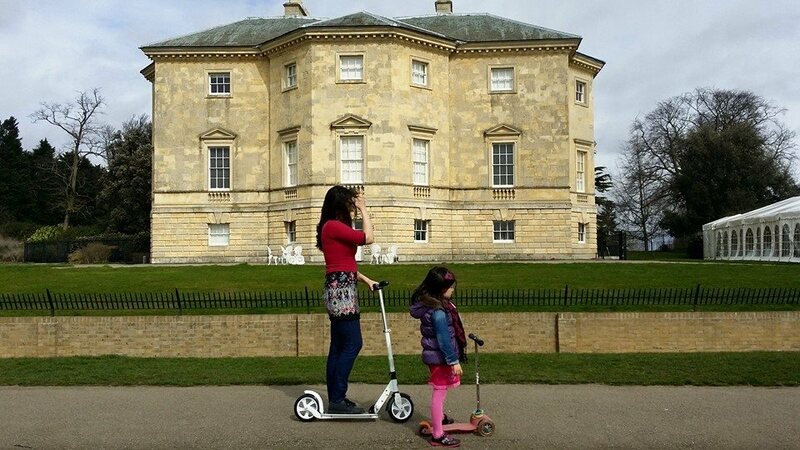 But this time I got it just having fun scooting with my daughter. I hope having done two half marathons, qualifies me to judge a good exercise. And this was a pleasant bonus, as I never seem to be able to cut the time for the gym. Now I can spend “just the two of us” time with my daughter (you guessed it right, that is how we call it now) and getting fit at the same time. I can also see me nipping to the local pool early in the mornings on my scooter, so I can be there in five minutes in stead of usual 15-20 minutes. Since having this scooter, I have heard lots of my friends saying I look slimmer and I feel it too! But be quick the offer runs out on the 20th of April 2015. Enjoy you ride, we are loving ours!